“Washington D.C. is on the brink of collapse. Lawlessness and instability threaten our society, and rumours of a coup in the Capitol are only amplifying the chaos. All active Division agents are desperately needed to save the city before it’s too late. 1. Massive Entertainment took the lessons learned from The Division and implemented most of the best liked features from the original – the right way. 2. Specialization adds a new layer of customization to the game – that is also hot swappable. You can tailor your loadouts for the Specialization you feel like playing. 3. The storyline is long and immersive. The story makes you care about the characters and the people of Washington DC. 4. Gear and weapon customization is balanced and fairly self explanatory, especially for those who played the first game – while also accessible for new players to the series. 5. Pick how you play. 3 options for game play; PvE, PvP, or Co-op. 6. Clans reward teaming up with your friends and working together. 7. Endgame that is both story driven and fun! 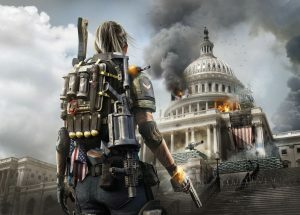 The Division 2 offers end game content from day 1 – and it doesn’t feel rushed or half done. 8. The game has a very dynamic (and ever changing) map due to circumstance. Gives a player plenty to do, without feeling grindy. Notes: With about 40 hours played, I have really enjoyed this game and the challenge of saving DC. Massive Entertainment has done an outstanding job following up the success of The Division 1 and continuing to give players a reason to keep coming back.